The Pacific Ocean spilled off the map! chaotic and blue that it didn't fit anywhere. That's why they put it in front of my window. Well, OK, the sea isn't right outside my hostel window; a classic car covered in spraypaint under a twisty "Where the Wild Things Are"-esque mural occupies that view. But if I were to slide down the steep cobbled street lined with candy-colored buildings, over a few precipitous drops, I'd eventually splash into the salty cold Pacific. 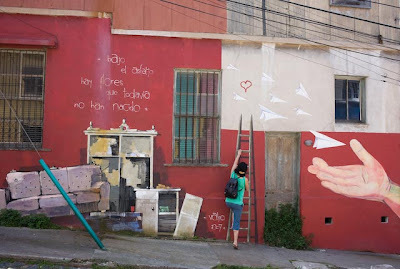 Valparaiso is an artist colony, a Dr. Seuss/Tim Burton town, packed with delightful absurdities. It's a playland, with impossibly stacked hills and houses connected by skinny twisty staircases and incline cars. Every wall is a canvas for murals, graffiti art, revolutionary declarations. Flowers grow from the spaces between cobbles in the streets. Artesan shops and hip little cafes and nasturtium vines sprout from the sides of narrow, winding streets. Men play drums on the propane tanks loaded onto the backs of trucks. The city spills colors all over itself. Wish I could stay here all week. But tomorrow, alas, we're off. Sounds like a dope town! too bad you can't stay all week. thanks for sharing all these snippets! Valparaiso sounds like a great place to visit, but I am glad you are returning home. I think the ladder's a painting Bob. How foolish I feel for thinking it was a picture. The big hand is a giveaway. Anyhow, hope you are well and that Kera gets back safely.